We bed flipped throughout the night, this kiddo here, the grown up moves there, another kiddo here. It wasn’t the most restful night of sleep. I was telling Ty it feels like we get one good nights sleep for every two that are interrupted. When we finally got up, we finished packing and then went in search of breakfast. Our driver wasn’t schedule to come pick us up till 11:30. We got some croissants and walked to the main square for some fresh juice. That’s been delicious! Nothing much was open yet, so we walked around a bit. L also managed to get clipped by a zipping scooter. Those things come out of nowhere so fast. L was crossing the walkway to throw something away and out it came. I grabbed him back as fast as I could but it still got him just a bit. Scared him and I a lot! The scooter guy stopped to make sure he was ok. So did a local shop keeper. Who then started to harass me about watching him more closely. Ugh! So thankful L wasn’t hurt. By this time, Ty had decided, if L really wanted a picture with the snakes, we would try and make that happen. So we wandered in the market for a bit till we heard the call of the pipes, and the drum of the snake charmers. At first they just kind of threw this little snake around their necks. But Ty really wanted that photo with the cobra. So we hung out a bit more and finally the guy saw us and pulled the cobra out from the blue drum. He then had L come around and sit next to him. It freaked me out that the drum he was antagonizing the snake with was the exact same color as L’s coat! But thankfully, nothing really happened. My kiddos got some amazing photos, and L was beyond thrilled. He immediately announced he wanted a snake as a pet! Not happening. We walked back to our house, and saw a few turkeys on the way. Our driver came and got us, we made it to the airport without and issues. We were a few hours early for our flight, and hoping to get some food in a lounge. However, those were only in the international terminals. We were dismayed when we went to check in for our flight, that not only was it immediately delayed by an hour, there was also no staff at the counters. Ty lined up and then he and I took turns waiting in line with everyone else on our flight for the next hour. Staff finally showed up and we were able to check in for our flight. Security was pretty intense as well. They took your passport, and stared into it, then your face. Asked if that was you. It was no joke! It was nice to get all that over with, but then we just sat in the waiting area. That thankfully had food! When staff members finally showed up (again!) to start boarding people for the flight, there was a total rush for the door. Then some rapid French started happening and we could tell there was mass confusion about the flight. The flight crew was asking the crowd who was going to Fez, then some passengers started shouting about who was going to Paris. It’s like there was a fight over the plane and where it was going. It was totally bizarre, and we didn’t understand most of it. It seemed decided that the plane was going to Fez so the Paris passengers were routed away from the doorways. We got through, and boarded our plane. The strange thing was before we took off we noticed those Paris passengers getting onto our plane as well. No idea how all that was worked out! Also apparently our flight was scheduled for 3:10 instead of the 2:10 that we bought our tickets for. We chatted a bit with some other passengers before boarding. Apparently some had bought the 2:10 flight like us, but most others bought the 3:10. No idea if they just combined the flights, but we were never notified of the change in flight time. This Air Arabia was so bizarre! We fly them from Fez to London so we really hope this was a one time issue, and not a regular occurrence. Thankfully it was an uneventful 45 minute flight. We landed safely in Fez. Due to staff issues it took us about 45 minutes to get our car, and leave the airport. But then we seemed to be back on track and headed out of Fez. Our destination was Chefchaouen, a city about 3 hours north of Fez. It’s renowned for its blue Old Town. Everything has to be painted these few shades of blue. The pictures seem incredible! Due to the flight delay and the car rental delay, we were going to be driving in the dark again. But thankfully the road seemed a lot less curvy than what we had been driving. Fez seemed like a large booming city. Right before we left the edge of town, we drove on the craziest street. It was like 1/4 road, 1/2 walk-way, and 1/4 market! I can’t believe we didn’t hit someone! But right after we got through this chaos, the hillside opened up and the countryside was beautiful! This was about the last photos I could take before sunset. After this the road, was hit and miss. The maps.me directions took us off on a 5 mile detour, through a partially constructed road. Then we added about an extra hour to our drive time by taking this road that was about half way there. Each lane was halfway eroded. So if someone was coming from the other direction, Ty was driving with two tires in the dirt. I can definitely say, I was praying for our safety, several times during this drive. There really wasn’t any where for us to stop and eat, or get the kids dinner. About 8pm we found a little quick market. These are basically small rooms, that are filled with chips, a small refrigerator for drinks, and crackers. So we bought the kids some sort of fruit/milk smoothie, and some crackers, while Ty and I each had a snickers bar for dinner. Then we hit the road again. Thankfully L fell asleep. R was just starting to get car sick again, when we pulled into Chefchaouen. We were so thankful our host was organized. He had someone meet us, at this square. They showed us where to park, since there is no parking in Old Town. Then he guided us to our house. It was so nice to get settled in! From what we could tell at night, these streets are beautiful. We couldn’t wait to see more in the morning! Ty woke up bright an early in the desert, about 6am. He worked the rest of us up about 8am I had pulled all the covers over onto my side, trying to stay warm. Have I mentioned it was freezing!! We had a good breakfast of rolls, yogurt, eggs, and these pancake/crepe things they make. With hot mint tea of course. Then we packed up, enjoyed a bit of the sunrise, then watched most of the group head out on camels. Here are a few photos from inside our tent. Then off we drove. We new we had about 7 hours of driving ahead of us. We also had a terrible experience with R’s car sickness on the way here, so we did our best to prepare. Knowing it was going to be daylight, we were hoping for better results. We made it to a good lunch stop. It was a hotel near the big movie studios. It had a play area, that we had to buy a ticket for, so the kids could play. Weird, but it burned some of their energy so we went for it. We had been trying to get some plastic bags, for the car ride, but everywhere they give you these fabric bags instead. I finally asked the waiter, and he took a while but brought out this reusable plastic grocery bag for us to keep. It was thoughtful, but we keep thinking there must be a ban on typical American plastic bags here. Which is a good thing! We also gave R some Dramamine. Here’s a screen shot of the worst sections of the road. We made a stop at one of the passes. Then out of no where, this kid shows up and offers to sell us a box of dates. L was dying to spend this money he had, so the kid sold a box to L for 2 euros. A pretty good profit for him! Then the kid whips a lizard out of his pocket and sticks it on L’s shoulder. So then the rest of us had to have a photo with it as well. It was so chill! The rest of the drive, though very long was uneventful. Oh well we did get suckered into buying some fake Moroccan geodes. There are all these guys along the road, holding up these brightly colored geodes, they’re incredible! So Ty saw a good one and pulled over. We thought we got a bargain with 4 for $50. Then the next stop, we found out the guy sold them for $10. I looked them up later, they’re homemade out of clay for like .75 cents! Oh well, we keep telling ourselves, they need the money more than we did! We returned the rental car in Marrakesh and the nice employee, arranged a taxi for us, to get to our Air BnB. It’s tucked into a part of town you can’t drive to. So the guy with with key, met us on the side of the road, then we had to walk through the maze of streets to the house. It’s an experience like nothing else, these winding, back, side streets. R was done going out for the night, so us girls stayed in, while the boys went out and got us some street sandwiches and fries. We were all happy to be out of the car and snuggled into warm beds. 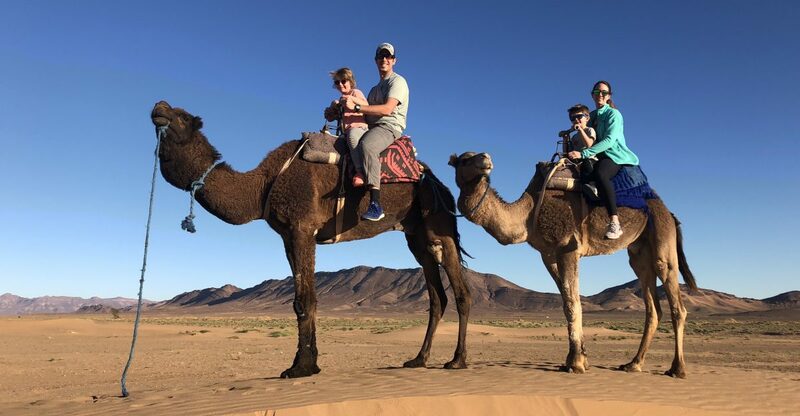 Ty has been eager to get to Morocco for a couple of years. So we planned 9 days of exploring in Morocco this year. Leaving Brussels was relatively smooth. Security was a breeze. Why can’t we get family lanes in the US?! We enjoyed a snack break in the lounge before getting on our flight. Ryan Air is very bare bones. You don’t get any drinks or food unless you buy it. They don’t even have pockets on the back of their seats. But it was just 3 hours long, and we had electronics and snacks, so we were just fine. We got through customs, with some weird flirting over pens. I’m still confused by it, but who argues with a customs official! Ty checked us in for the rental car, and here’s where the day starts going down hill. The desk agent sends us out the doors, up the stairs, and to the tower. Well we go out the doors, up the stairs, and there is no tower. Just a giant, wal-mart size parking lot. With no rental car signs, or employees in sight! We walked from one end of the giant parking lot to the other. Across to the other corner, in the blinding hot sun, before we finally found someone who knew where we should go. It was INSANE! How is this a large well established city?! There were these interesting lanes in the city. A full size lane, a half size lane next to it with a bike/motorcycle lane sharing it. I tried to get a picture to capture this. It is so different here, definitely a good culture shock. Our destination was estimated about 3.5 hours outside of Marrakech. So we anticipated a long drive, hoping to keep most of it, prior to the sun setting. After about an hour, R was getting a little car sick, so we found ourselves a cafe/hotel. Right as we pull into the parking lot, she starts getting sick. But she’s a good puke and rally kiddo. We got back on the road as soon, as we ate, and the kids started listening to an audiobook. The scenery was beautiful, but the buildings are very basic. Mostly mud structures along the road. Sunset was later than we expected, about 7pm. Then we hit road construction. These roads were so bad, rough sections, lanes would go from two to one, with no warning. There are no lights, no paint, and limited signage. Giant trucks would come zooming around a corner, into our lanes. We were also climbing a pass, so the road, was very squiggly. It was basically, a nightmare situation for someone who gets car sick. I was not as prepared as I should have been. We had one air sickness bag from the airport which didn’t work out so well. Poor R was covered in it, after that second ‘event’. So we had to strip her down to her pants, and try and clean up the car as best we could with a few wet wipes. By the third ‘event’, we were scrambling to find any spare bags we had. Leaving the restaurant maps.me estimated about two hours left of driving. However, when we hit the construction we drove for another hour without our ‘estimate of arrival’ changing at all. 🤦🏻‍♀️ So what was going to be a 3.5 hour drive became a 5+ hour drive. Poor R, just kept asking when we were going to arrive, and I had to keep saying about 2 more hours. It was a long, long evening. We were so thankful to arrive at our hotel! L thankfully fell asleep about an hour before we arrived. So Ty carried him in and put him right to bed. R, we had to wash off in the shower, because she was covered in vomit. Only after we had showered her did we realize they forgot the towels. I tried to dry her off with one of Ty’s t-shirts. Then we bundled her into bed. The room was quite cold, since they don’t have the heat on until you arrive. She went to sleep with her scarf and hat on her head. Morocco, you will be an adventure! We’re off to Brussels! We woke up at 6am so we had plenty of time for a leisurely breakfast and packing, while trying to keep our kids voices quiet in the hotel, this morning. We’re all looking forward to having an apartment in Brussels so we can have more room, and not be so noise conscious. The train was comfortable and had wifi. It did rock quite a bit so we didn’t want anyone reading or watching any shows. I typically have no issues with motion sickness but even that train had me feeling a bit uneasy. So after some card games, and lots of hot wheels playing, the kids settled down to listen to a Laura Ingles audiobook. We arrived in Brussels around noon, and immediately loved the city. It’s very large, but unlike Frankfurt, there is lots to see, and it’s a beautiful city. The temperature in Brussels is around mid-30s so we added on the extra layers and headed out to find the Senckenberg Museum, their natural history museum. I hate to say it, but we’re becoming museum snobs. We love a good natural history museum. There’s something for everyone in our family to enjoy. However, this one fell a bit short. The exhibits were a bit sparse, oddly arranged, so the visitors had to clump up, and frankly, the museum smelled. It was an odd mixture of glue/body odor/dust. However, on the bright side, spending a few hours learning and being warm inside a museum, is never a bad thing. We always walk away having learned something new. We closed the museum down at 6:30 and walked back towards our apartment. There’s this beautiful little square just down the street from us, so we stopped there for dinner and groceries. It was supposed to be this amazing burger place, again we’re spoiled American’s, we know good burgers! These were decent. Seems like I’ve been complaining a bit on this post, but we’re still having a great trip. I think it’s just worthwhile to point out that every moment of this trip isn’t all sunshine and roses, but thankfully it’s all super minor. So for our 6th Annual Hampton Family International Christmas trip Ty found us some awesome tickets back to Europe. There are so many different countries to explore over here, that this is our third Christmas in a row, and we’re still visiting new locations! We got a United flight from Anchorage, to Denver. We were able to spend the day in Denver with family. It was an incredible way to break up the long flights. The kids opened presents with cousins, and most of us napped. We left Denver on a 5:45pm flight to Frankfurt, Germany. Our actual tickets purchased continued on to Reykjavik, Iceland, however when offered the choice between German Christmas markets or Iceland in December, it was a no brainer to hop off early. The key to this, was we didn’t check any luggage. So when we landed in Germany, we just walked off and went through customs. The flight was only 9 hours. It went as smoothly as we could hope for. R slept on the floor, and L slept across their two seats. The flight attendants didn’t seem to notice/mind. Thank goodness because this allowed us all to get a few good hours of sleep. Our only speed bump came at the end of the flight. Like has happened before, R got an upset tummy and threw up right as we were landing. Of course our row had zero air sickness bags. L decided his tummy was upset too, but thankfully he never got sick. Uneventful getting off the plane, and through security. Ty directed us easily through to the train, into Frankfurt Main. Our room wasn’t ready yet, so we did what all parents do, we found the nearest playground! Enjoyed some fresh air, and stretching our legs. We finally get into our room, shower and change clothes which feels amazing after basically 2 days. Then we all lay down for a ‘short’ nap. Ha! That turns into almost 2 hours. And we finally drag the kids out of the hotel about 6pm for a nearby dinner. Food was good. Being back in Europe feels wonderful. L is currently asleep underneath the pull out couch. His choice! While we wait for R, to get tired. Jet lag is always an experience. Can’t wait to see what adventures await us tomorrow! We let the kids play on the beach in their jammies this morning. They made castles, found beautiful shells, and played with a girl camping next to us. Ty and I finished packing and just enjoyed waking up at the beach for our final day. We finally packed up and started the long drive to Auckland. Taking a brief break to check out one final waterfall, of course. These kids have been such good travelers!! We had to make a stop at Giapo, in Auckland. We read about it, and heard from a few people that their ice cream is amazing. So we tracked it down. They make really incredible sculptures cones. Like a giant octopus, seriously check out the link! But we knew we couldn’t eat that much so we went with the reasonable sized cups. It was SO yummy by SO rich!! I couldn’t even finish mine. Definitely worth checking out! We had a bit of a scramble at the RV return. Just because I was unloading everything while Ty was trying to get a massive discount from them for all the issues we had. In the end, we got the discount and managed to catch the very last shuttle to the airport! Security was a breeze. I’m bummed I didn’t take any pictures of the lounge we went to prior to our flight. It was maybe the nicest one yet! Nice and large so we don’t feel like we’re on top of other people. Good food, not just snacks. Wonderful drinks for grown ups and kids. It was a perfect recharge prior to starting our long journey home. We made it on the plane and get settled into our Sky Couch! Waiting to board in Seattle and Linc just couldn’t quite make it. All in all, it was a very long journey home. But uneventful, which is how we like them. So very thankful we had another amazing adventure with my kiddos. They truly are the best travelers!